If you love spice, you’ll love this Salt Table favorite! And, it’s a perfect to say I Love you, Southern Style. These themed gift boxes containing Salt Table favorites and Georgia Grown’s fabulous gourmet foods. 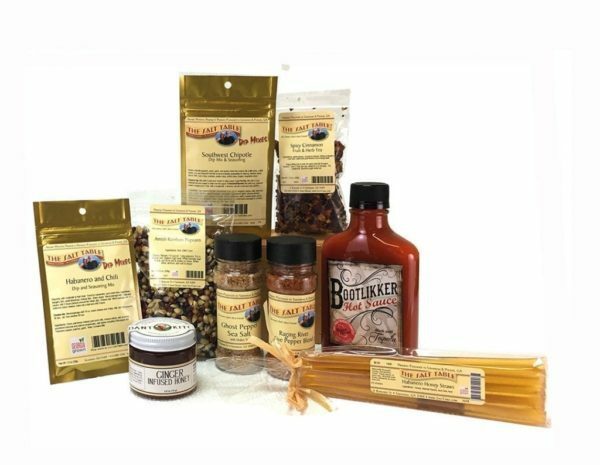 All of these delicious products are made in Georgia. This gift box has Spice and some Heat! Perfect for a Valentine’s day, Birthdays, an Anniversary or any other Holiday or special moment to celebrate! 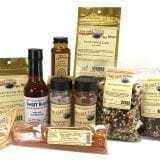 Salt Table Southwest Chipotle Dip and Seasoning Mix, 1 oz. Salt Table Ghost Pepper Infused Sea Salt, 3 oz. Salt Table Spicy Cinnamon Fruit Tea, 1 oz. Bootlikker Hot Sauce, 6 oz. ***We will substitute, at an equal or higher value, similar products if we are out of one of the basket products.